The Fairest of Them All is a re-imaging of the classic fairy tale stories of Rapunzel and Snow White. The idea is unique. One fateful evening, Rapunzel has a torrid affair with a handsome prince who happens to be betrothed to another woman. After spending a passionate night together Prince Josef returns to marry his betrothed while Rapunzel stays within her tower with the witch, Mathena. After the mysterious death of his wife Josef, now King, returns to the tower to claim Rapunzel as his new bride thus making her Queen and the step-mother of his young daughter, Snow White. While this novel is full of potential for a unique re-telling of these classic tales both the story and the characters fall flat. The story idea is the greatest strength of this novel but how much credit can be awarded to a book simply because of a good idea? It is the execution of this idea that must be evaluated and the execution in The Fairest of Them All is poor and lacking. The text immediately reads cold and disconnected. Turgeon desperately wants the reader to connect with a young and optimistic Rapunzel who is joyful and kind. Instead, it feels forced and disingenuous. Prince Josef arrives at the tower seeking the young girl he heard singing and first meets young Rapunzel. Their encounter was supposed to be the first meeting of two destined lovers; two people who were meant to spend their lives together but are star-crossed and will have to overcome major obstacles to be together. The passion wasn’t truly there. Josef appears lecherous and Rapunzel is simply a timid and curious young girl. The “love” story was absent replaced by pure physical desire. The characters themselves were also poorly developed. Of all of the characters the one that felt the most genuine was Rapunzel herself. She was the one character that was multi-faceted and who truly developed and changed throughout the novel. She reacted with authentic emotion to the events of her life and her actions were understandably motivated, despite being wicked. By contrast, King Josef and Snow White were poorly written. There was little, if any, development beyond what has been depicted in their classic tales. Snow White was perfect simply for the sake of being perfect. There was no development of her character neither was there any explanation for her perfection. It was a battle between a well-written re-imagined Rapunzel and a bland classic Snow White. It didn’t work. The struggle between these two characters would have been better served if Snow White was re-imagined as well and given more dimension than being flawlessly perfect. Turgeon does take creative license with the story. Her novel does include a few shocking surprises which does at least justify her re-imagining of these classic tales. 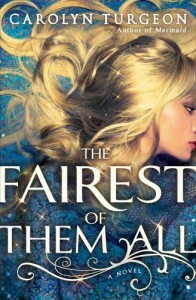 The Fairest of Them All does have a few dark moments bringing this in line with the tone of a Brother’s Grimm fairy tale, although it still falls short of being a novel. I could have done without the sexual content (both implied and otherwise) as well as the other distasteful content. I struggle with identifying an appropriate audience for the novel as I would never recommend it to a teen due to some of the content yet it reads as far too immature for an adult reader. For anyone interested in a re-imagined fairy tale I would recommend reviewing the works of an author like Gregory Maguire who truly elevates classic tales with his re-imagined stories. Turgeon’s novel, while creative, simply struggles.